Docker supports LDAP integration for user management. Many organizations that are leveraging Docker are cloud forward, so a great deal of their IT infrastructure is located off-premises. Installing an on-premises LDAP to manage Docker and other applications is a complete anathema to IT admins. Leveraging a cloud-based LDAP-as-a-Service solution is preferred. In this blog post, we’ll talk about the benefits of integrating Docker and JumpCloud LDAP-as-a-Service. Docker burst on to the scene in the spring of 2013 and has been transforming the way that developers, operations, and IT personnel have been thinking ever since. The conventional approach to servers is dramatically changing due to the concept of containers. The benefits are immense. Containers offer a lighter weight means of application implementation and building out your infrastructure. Each container does not need to leverage a full copy of the operating system, instead it only leverages what it needs. The host operating system also serves as the base host operating system for containers; the containers are lightweight add-ons that house the application. Horizontal scaling is far easier. Containers are meant to be single purpose. Therefore, expanding the number of containers you need because of load is far easier than spinning up new machines and the associated networking. Containers can be viewed as being more secure, too. Since they are single purpose, they can be easily updated or destroyed if a vulnerability is detected. Users don’t necessarily login to containers, so that magnitude of attack is reduced. The challenge with Docker containers is that they need to be orchestrated and managed. There are a number of solutions available that manage containers. Each solution needs to have strong user management capabilities to ensure that only the right personnel are creating, modifying, and deploying the Docker containers. Just as users are controlled tightly on production infrastructure, the same should be true with the Docker infrastructure. To this end, Docker has provided support for managing users through LDAP. JumpCloud’s virtual LDAP service is an ideal cloud-based directory service to manage users in Docker. Users are either input or imported into JumpCloud’s Directory-as-a-Service® platform. The users can then be permitted to work with Docker by enabling the LDAP functionality within the SaaS-based directory service. By enabling LDAP, any application that supports LDAP should be able to connect and authenticate access. The application itself – in this case Docker – is configured to authenticate users to a global network of virtual LDAP servers. The benefit of a cloud-based directory service is that the IT organization doesn’t need to spend time building and maintaining the directory infrastructure, they just get to use it. Enter your users, connect them to the IT resources they need, and be on your way doing more productive activities. That’s the essence of ‘as-a-Service’ software, and it couldn’t be felt more powerfully than with directory services. Building and running a high-availability authentication infrastructure is time consuming and expensive. Instead, organizations can leverage JumpCloud’s Directory-as-a-Service and spend more time working on the applications that sit inside of their Docker containers. That’s where we believe, at least, that our customers should be spending their time. 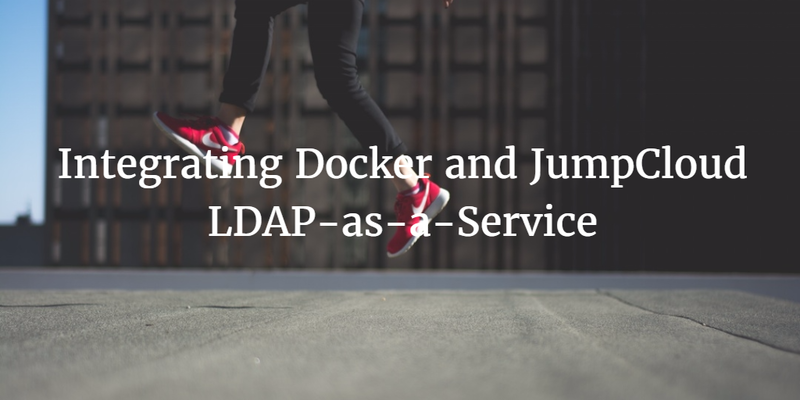 If you would like to learn more about how you can integrate Docker with JumpCloud’s LDAP-as-a-Service functionality, drop us a note. Or, feel free to give it a try by signing up for an account. Your first 10 users are free forever.